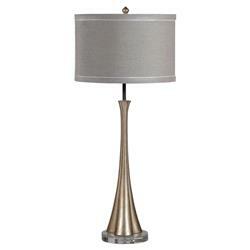 Graceful shapes and metallic tones give this table lamp a modern style. Brushed silver accentuates the curved stem of the lamp, landing in a round, clear glass base. Natural linen finishes this floral-inspired, transitional table lamp.